Image caption The survey found that 30% of those surveyed wanted the walls to remain, while 49% wanted them to come down. There has been a rise in the number of residents, especially in Protestant areas, who want the nearest peace wall to remain standing, a survey suggests. Over 1,000 people living close to peace walls in Belfast, Londonderry, Lurgan and Portadown took part in the study. A survey in 2012 found 22% of residents wanted walls to remain and 58% wanted them down immediately or in the future. However, in 2015, 30% of those surveyed wanted the walls to remain, while 49% wanted them taken down. Many more Protestants - 44% - wanted the walls to remain the same, compared to only 23% of Catholic residents. The survey also found that a majority of Protestant residents living close to peace walls say their area has not benefited from the peace process. By contrast, only a quarter of Catholic residents close to peace walls expressed that opinion. "I love my house, but if the peace wall wasn't here I wouldn't be here. "I feel secure with the peace wall - the peace wall, to me, has to remain. "There's no way that I would be here [without it], I know my neighbour next door wouldn't be here as well, because we still get bricks and bottles and golf balls coming over the wall, maybe not every week, but every two weeks or three weeks. "Without that wall they'd be in at my back door, there's no two ways about it." The findings are included in the latest 'Public Attitudes to Peace Walls' survey, commissioned by the Department of Justice and carried out by researchers from Ulster University. The study also found that more than four in 10 people never interacted with anyone from the community living on the other side of the nearest peace wall. However, a significant majority of those who did meet with the other community said the contact was 'positive'. More than half of residents (55%) felt the peace walls sent out a bad image of Northern Ireland to people abroad. A majority of residents expected significant incidents of anti-social behaviour or sectarian violence if their nearest wall came down. 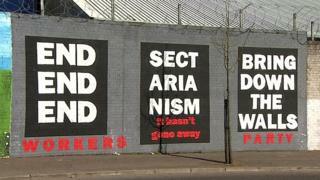 Peace walls were first erected in Northern Ireland in the late 1960s, as a temporary measure to minimise violence between nationalist and unionist communities. Image caption Peacelines, like this on at Roe Street in north Belfast, were first built in the late 1960s. Decades later, many are still in place. The Northern Ireland Executive, through its Together Building a United Community Strategy (TBUC), has a target to remove all peace walls by 2023. However, the survey found that almost three-quarters of those surveyed knew little or nothing about that initiative. The report's authors said that their findings showed policy-makers would face a "significant challenge" to develop other ways to reassure residents about their safety other than walls. "The level of pessimism around the actual and potential benefits of the peace process is striking," they said. Is NI ready for peace walls to be removed?